He hunted a rather large book case for a reference book, then found the directions to a particular volume and page that contained the nugget he wanted to share. After sitting with the large volume, Eliyahu began to read in Hebrew and translate on the fly into English. I must have been really tired because I was having trouble focusing and following the story, then, BAM! Fireworks went off in my head! “R. Simeon b. Pazzi pointed out a contradiction [between verses]. One verse says: And God made the two great lights,2 and immediately the verse continues: The greater light . . . and the lesser light. The moon said unto the Holy One, blessed be He, ‘Sovereign of the Universe! Is it possible for two kings to wear one crown’? He answered: ‘Go then and make thyself smaller’. ‘Sovereign of the Universe’! cried the moon, ‘Because I have suggested that which is proper must I then make myself smaller’? He replied: ‘Go and thou wilt rule by day and by night’. ‘But what is the value of this’? cried the moon; ‘Of what use is a lamp in broad daylight’? He replied: ‘Go. Israel shall reckon by thee the days and the years’. ‘But it is impossible’, said the moon, ‘to do without the sun for the reckoning of the seasons, as it is written: And let them be for signs, and for seasons, and for days and years’.3 ‘Go. The righteous shall be named after thee4 as we find, Jacob the Small,5 Samuel the Small,6 David the Small’,7 On seeing that it would not be consoled the Holy One, blessed be He, said: ‘Bring an atonement for Me for making the moon smaller’. This is what was meant by R. Simeon b. Lakish when he declared: Why is it that the he-goat offered on the new moon is distinguished in that there is written concerning it unto the Lord?8 Because the Holy One, blessed be He, said: Let this he-goat be an atonement for Me for making the moon smaller. (2) Gen. I, 16. , (3) Ibid. 14. , (4) Righteous men shall be named ‘the Small’ after the moon which was reduced to become the small luminary. , (5) Cf. Amos VII, 2: How shall Jacob stand? for he is small. , (6) A renowned Tanna of the first century, called ‘the Small’ on account of his humility. (7) Cf. I Sam. XVII, 14: And David was the youngest (smallest). , (8) Num. XXVIII, 15: And a he-goat for a sin-offering unto the Lord. These words, ‘unto the Lord’, are not found in connection with sacrifices on other festive seasons. I must have been vibrating in place because I was so excited. New insight into something from the previous day’s Torah Portion! My immediate thought was a comparison between the Greater and Lesser Lights with the Memra de Yeya and other studies I have done with the Angel/Messenger/(Malak) of the Lord. I suddenly had much depth added to thoughts I have previously shared on these topics. Well, I have had time the last few days to further consider the illustration and have had additional insight! Judaism, at least in some minor streams of thought, teaches that there is a Greater YHVH and Lesser YHVH, though they are echad. Rabbi Itzhak Shapira’s Return of the Kosher Pig (also available in Hebrew) really helped me understand some of this reasoning and the implications. Could the sun and moon be a hint? Scripture tells us that ‘no man can see God and live.’ In similar manner, if I go outside and stare up at the sun, I will fry my retinas. BUT, I can go stare at a huge full golden moon and through the soft reflection, I can see the fullness of the sun painted on the moon. It is amazing that the God of Abraham, Isaac and Jacob, would condescend toward His people by revealing Himself at points through a being that man can more easily relate to. Still another thought to consider is that there is only one light. It may have the appearance of being two lights, but all originates from the sun and is merely reflected making the sun and moon echad while bringing a ‘yachid’ message/light. I have a few more thoughts on this picture from the Gemara, but want to share only one final one: Why an offering connected with the new moon? Hmmm…. So, after having a short but lively discussion with Eliyahu, Al and I hit the road back to Ariel, Israel. 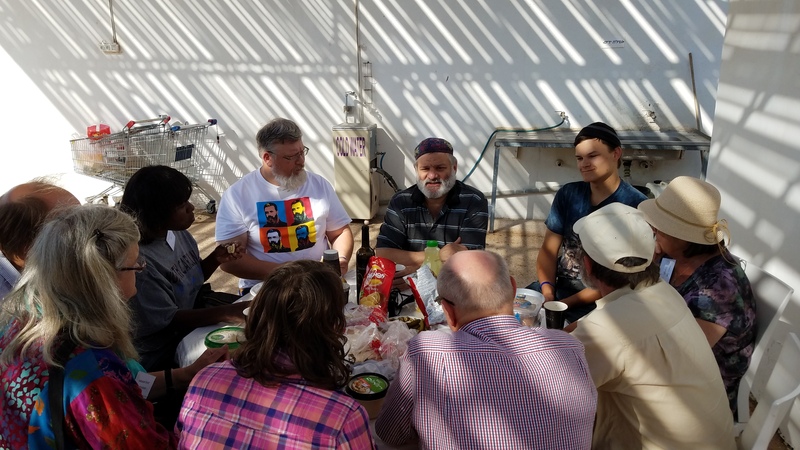 Our discussion continued with thoughts that bubbled up as well as wondering how much more depth and introspection can come from simple dialog with our Jewish brothers. Truly, these are amazing and exciting times! This entry was posted in B'Ney Yosef Congress, Travel and tagged angel of the lord, creation, memra, moon, sun, Yeshua. Bookmark the permalink. ponderings and did not know where to go to share them. As you well know, not everyone is at the same place, at the same time. This is glorious confirmation to me that I am seeing /understanding correctly in this area. The thoughts you shared here line up perfectly with many Scriptures and bring great clarity which strengthens our Relationship with YHVH. What a Blessing for you to have had this special time! And what a Blessing for all of us as you share these things with us! Are you still in the Land Pete? I am not sure how to say, ‘Wow!’, in Aramaic, but that is certainly the response required. I think you very much ‘got it’. Thanks for the lesson, achi, and I look forward to many more and much beneficial interaction!